The U.S. economy isn't what it used to be. Under Donald Trump's leadership, the U.S. is in the process of forfeiting its position of economic supremacy. An internal EU document shows that the Europeans are worried. Stanley Fischer, the 73-year-old vice chair of the US Federal Reserve, is familiar with the decline of the world's rich. He spent his childhood and youth in the British protectorate of Rhodesia, in present-day Zambia and Zimbabwe, before going to London in the early 1960s for his university studies. There, he experienced first-hand the unravelling of the British Empire. History repeats itself, sometimes even within a single person's lifespan. Now an American citizen, Fischer is currently witnessing another major power taking its leave of the world stage. Under the leadership of President Donald Trump, the United States is losing its status as a global hegemonic power, he said recently. America's role as guarantor of global organizations like the International Monetary Fund (IMF) can no longer be taken for granted, Fischer says. "I had a picture of the world economy in which the United States was an anchor," he recently told the Financial Times. "Not a source of volatility." The U.S. political system could take the world in a very dangerous direction, says the economist, who has held a number of powerful positions in his career. He has been the chief economist of the World Bank, deputy managing director of the International Monetary Fund and governor of the Bank of Israel. His resume makes him part of the caste of "globalists" despised by Trump supporters. Fischer is seeing things today that he has never experienced in his entire professional career. For instance, he believes the current US government's efforts to loosen regulation of the banking sector, hardly more than 10 years after the financial crisis, are simply "mind-boggling." Last Wednesday, Fischer took the next logical step and announced his resignation, meaning that the world's most important central bank will lose an undisputed expert. It is quite possible that Trump will replace him with another of his acolytes. Either way, America's reputation in the world of economics and finance is taking another hit. For decades, the United States was something of a guarantor of global economic stability. It helped Western Europe emerge from the rubble of World War II with a massive redevelopment program, the Marshall Plan. Whenever there was a financial crisis somewhere in the world, the U.S. Treasury Department and the IMF joined forces to orchestrate supporting measures. When the worst world economic crisis in 80 years erupted in 2008, the Americans led the globally coordinated rescue effort. Little is left of that dominant position. The United States, a former superstar, is now fighting to stay in the top league. The economic policy coming out of Donald Trump's Washington is characterized by timidity and despondency, sometimes erupting into boastful nationalism. The former economic superpower has embarked on a self-prescribed retreat. Once the home of the Washington Consensus, a policy that emphasized international cooperation, competition and market forces, the U.S. capital is now beset by economic navel gazing. Everything that formed the basis of the West's economic triumph in the last few decades has been discredited. Trade agreements are being called into question, while traditional partner countries are being sharply criticized for supposedly causing unemployment. A nation once bursting with self-confidence is now plagued by self-doubt and fear of decline, as it increasingly isolates itself. Trump takes every opportunity to complain that the United States has been bamboozled in trade agreements, accusing his predecessors of negotiating bad deals. In Trump's world, it is almost as if the United States were a victim and not an enabler of globalization. Inferiority complexes, fears of decline, incompetence: All of it is having an effect on America's status in the world. At international meetings like the G-7 and the G-20, Americans are being sidelined because of their lack of a coherent position. On important issues, from climate change to trade policy, Washington is increasingly finding itself unanimously opposed by other members. Just how deep the divide between the EU and the U.S. has become can be seen in an internal position paper from the Economic and Financial Committee of the European Union. The committee consists of top officials from the finance ministries of member states, who coordinate a joint EU position on important economic policy issues. This time the experts are weighing in on a different document, a July IMF assessment of the condition of American economic policy. That report alone is eye-opening. The IMF has adjusted its 2017 and 2018 growth forecast for the United States downward, and it has urged the US government to finally address pressing problems such as the aging of society, flagging growth and the unequal distribution of income. For the Europeans, the criticism coming from IMF experts doesn't go far enough. They view Washington's deliberations on restricting free trade and international cooperation as an attack on economic world peace, but also as a detriment to the United States itself. The EU financial policy experts are critical of the IMF, saying that it should have focused more strongly on the risks of growing protectionism. "Its impact may be much more adverse than currently acknowledged," they write. The document reads like a settling of scores with the economic policy of the Trump administration. Item by item, the experts tear apart virtually all the plans of the current US administration. On government spending, for example, the EU committee argues that because "public sector debt is already on an unsustainable path," Trump's extravagant budget planning poses "nearer-term risks for the global economy." Instead, the paper argues, the U.S. government ought to "adopt measures on both the revenue and expenditure side in order to ensure longer-term sustainability." This is a barely concealed call for the Trump administration to cut spending and raise taxes. The document continues: "We find that the administration's proposed reorientation of expenditure towards defence is contrary to wider policy goals concerning inequality and boosting potential growth." On investments: The Europeans are concerned that international investors have been increasingly avoiding the United States recently. "The decline of the net international investment position, albeit also reflecting the strong performance of the U.S. economy and valuation effects, is a potential vulnerability," the EU paper reads. On taxes: The planned tax reform, which would primarily reduce the tax burden for upper income classes, "is likely to aggravate rather than address the widely discussed challenges to U.S. economic outlook, such as an increasingly polarised income distribution, rising poverty and falling labor force participation." On health insurance: The goal of eliminating the Affordable Care Act, which is frequently referred to as Obamacare, is also viewed critically. "It deserves to be recalled that the U.S. already ranks poorly in health care coverage among other OECD countries and that the proposed reform might lead to a further deterioration." None of this is minor nit-picking. The document exposes substantial differences of opinion between former partners - and it lays bare Europe's belief that Trump's America is in the process of losing its claim to leadership. The incompetence in Washington has already claimed one victim: the dollar. As recently as the beginning of the year, foreign currency experts were still anticipating exchange rate parity between the U.S. dollar and the euro. But that has now changed. The euro surpassed the $1.20-mark last week and has been hovering just below that threshold since then. The dollar is not just performing poorly against the currency of the newly strengthened euro zone. It is also losing value against other battered currencies, like the British pound and the Japanese yen. The dollar's loss against other currencies signifies nothing less than a vote of no confidence against Trump and his team. The political newcomer's grandiose announcements of a new era have been followed by failure after failure. The U.S. president has not managed to get a single one of his major projects off the ground. The promised repeal of Obamacare has already failed twice, the vast tax reform that was announced with such great aplomb hasn't materialized, and the pledged investment offensive is faltering. This has an unavoidable impact on the country's role in the world economy. Indeed, a tectonic shift in the world currency structure is underway. In the last few decades, the American dollar has always strengthened when a political crisis erupted somewhere in the world, prompting investors to seek refuge in the only remaining superpower. The dollar was seen as the most secure safe-haven currency on the globe. The U.S. currency was a constant for financial markets, even when the system of largely fixed exchange rates came to an end in the early 1970s. A statement made by former Treasury Secretary John Connally summed up the Americans' self-confidence: "The dollar is our currency, but it's your problem." That has changed, and Trump's presidency isn't helping. When the conflict with North Korea came to a head recently, the dollar lost a significant amount of its value, with international investors shedding their positions. The once undisputed reserve currency is suffering in two ways. Trump's incompetence is not only undermining America's economic foundations. The isolationist course he is charting is ruining the country's reputation in the world together with that of its currency. The euro is one of the beneficiaries of the dollar's decline, something Klaus Regling sees reflected in his travel expense reports. As head of the European Stability Mechanism (ESM), the euro bailout fund, he is essentially the euro's primary booster. He has spent years traveling the world to encourage international investors to buy the bonds issued by the ESM. The proceeds are then used to bail out cash-strapped member nations. Regling spent years explaining the complicated construct of the euro to Asians, South and North Americans, convincing them to invest their money in ESM bonds. Recently, though, he has begun spending more of his time at his desk in the ESM headquarters building in Luxembourg. Business, after all, is doing just fine without him. "I don't have to do much advertising for the euro anymore," he says with satisfaction. "Investors have recognized that the euro crisis has been overcome and that the euro zone is in good shape again." It is certainly in better shape than the United States. Growth in the monetary union recently surpassed that of the United States and unemployment is declining in almost all member states. The United States has a high trade deficit while the euro zone is experiencing surpluses. Compared to the United States, the euro zone now feels like a haven of stability and predictability. The austerity programs in Europe's crisis-ridden countries have worked. Even Greece is back on track and is now able to raise cash in financial markets on its own. Trump administration chaos is not helping to build confidence in the dollar. On the contrary, Trump and his troops are not just managing the decline but are in fact accelerating it. "The United States has been losing influence on the international stage for some time, as China and other emerging economies gain in importance," says ESM Managing Director Regling. "This is why a multipolar currency system is currently taking shape, one in which the euro plays an important role." unless things change in the U.S."
Plunging costs have fueled new space ventures by public and private companies and wealthy entrepreneurs. Some will even succeed. Sixty years ago this October, while Elvis Presley’s “All Shook Up” was topping charts, a simpler tune picked up by a BBC monitoring station shook the world. A short, repeating string of boops and beeps turned out to be the broadcast of a distant metal orb the size of a beach ball with four long antennae. The Soviet Union’s Sputnik 1 had become the first artificial satellite launched into orbit. A global space race followed. Today billionaire technology titans are pouring money into space, creating the fastest pace of change in decades. SpaceX, a side project of Tesla(ticker: TSLA) founder Elon Musk, has grabbed a leading market share in commercial satellite launches by undercutting its main rival, Europe’s Arianespace, by up to 40%. Musk’s long-term goal is to colonize Mars. Jeffrey Bezos, founder of Amazon.com (AMZN) and privately owned Blue Horizon, plans to compete on launches, too, and has a vision of moving manufacturing to space. Richard Branson, of Virgin Group, hopes to sell space flights to vacationers. Other players are planning to mine meteors for precious metals. Launch costs have fallen more in the past decade than in the prior whole of the space age. Meanwhile, CubeSat, a university-developed standard for small, cheap satellites, has opened the market to new players. Some of the better-financed ones aim to launch communications satellites into low orbit by the hundreds or even thousands, covering the globe with data services and upending incumbent players that rely on a handful of costly, higher-orbit satellites. Public investors are best off staying clear of the upheaval in commercial satellites, and focusing instead on exposure to the U.S. defense and intelligence sectors. Goldman Sachs GS in Your Value Your Change Short position predicts that spending there will grow 6% a year, compounded, over the next five years. That will benefit aerospace giants like Boeing (BA) and Lockheed Martin (LMT). Orbital ATK (OA), a much smaller defense contractor, looks like another winner. On the commercial side, there is already a cyclical downturn, because new satellites offer so much more bandwidth than those they replace that demand has yet to catch up. ViaSat (VSAT), a provider of broadband internet service from space, could be vulnerable to future swarms of small satellites. Nascent space booms have fizzled before. In the late 1990s and early 2000s, insurgent satellite players included Globalstar, Iridium Communications, and the Bill Gates–backed Teledesic. All went bust; the first two have since relaunched. But it doesn’t take a rocket scientist to understand why past investors have turned to the space business. Click here for larger version of table. A traditional satellite takes two to three years to build and costs $300 million—half for the hardware, a third for the launch, and the rest for insurance and other costs, according to estimates from Goldman. Once operational, it can generate $40 million to $60 million a year in cash, for 15 years. Today, there are about 1,500 satellites in orbit, including a quarter for military use, although these account for three-quarters of spending. The U.S. is the biggest player, controlling 40% of satellites, followed by China at 13% and Russia at 10%. Most launches use multistage, expendable rockets to escape Earth’s atmosphere. The Space Shuttle program, built around crewed, reusable spacecraft, ended six years ago after more than 130 successful flights and two deadly failures. 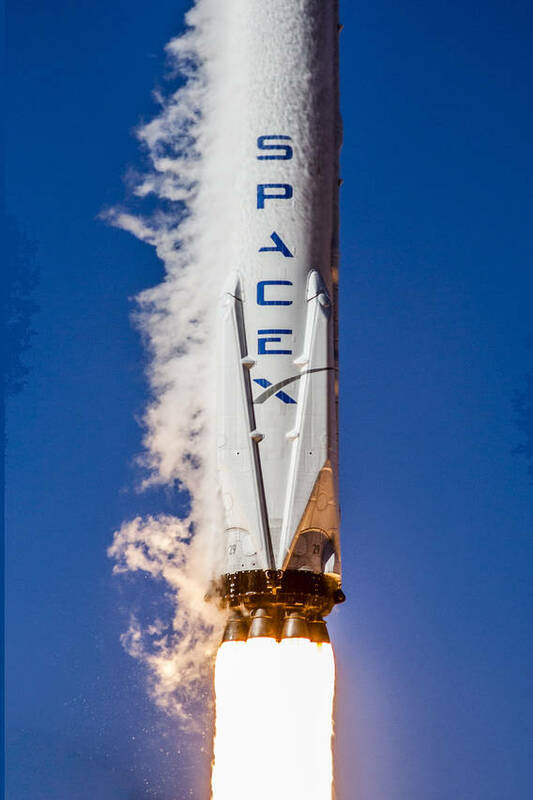 But what’s old is becoming new again: This past March, SpaceX launched a Falcon 9 rocket from Cape Canaveral, Fla., and delivered a communications satellite into orbit, while returning the rocket’s valuable, 14-story main body to a drone ship floating in the Atlantic Ocean. What made the flight unique is that last year, this particular rocket helped deliver supplies to the International Space Station, making its latest payload mission the world’s first with a used rocket, and probably signaling more launch price cuts to come. MOST SATELLITES OPERATE IN what’s called low-Earth orbit, typically 100 to 400 miles away, where they whip around the planet about every hour and a half to two hours. Others operate much farther out, about 22,000 miles away, in geosynchronous orbit, where they travel with the Earth’s rotation to stay above the same point. Geosynchronous satellites provide constant coverage over wide areas, making them ideal for broadcasting television and radio. They’re useful for two-way communication, too, but with a slight lag—fine for airline Wi-Fi, but not so much for demanding tasks like gaming. Low-orbit satellites can provide broadband service with minimal lag, but with their limited and constantly changing coverage area, it would take a vast fleet of them to make such service viable. They are used largely for imaging. Enter the disrupters. Privately held OneWeb, backed by funding from Virgin Group, QualcommQCOM in Your Value Your Change Short position (QCOM), and SoftBank Group9984.TO in Your Value Your Change Short position (9984.Japan), received regulatory approval in June for a constellation of 720 low-orbit communications satellites. It plans to start launches next year and begin service as soon as 2019. Its goal is to bring affordable, high-speed internet access to the entire planet by 2027. In May, SpaceX told a U.S. Senate committee that it wants to launch more than 4,000 small satellites into low orbit by 2024. SpaceX’s Musk could be looking for a cash cow to better compete with Bezos, who briefly dethroned Bill Gates in recent weeks as the world’s richest man. Bezos’ Blue Origin announced in March that it has its first paying customer for its heavy-lift rocket, New Glenn, which will enter service in 2020. Another Blue Origin program called New Shepard aims to provide suborbital space tourism, allowing passengers to experience cheek-stretching takeoffs and several minutes of weightlessness via a reusable rocket and capsule, with crewed launches planned for next year. Virgin Galactic, which is also pursuing space tourism, is testing a satellite launch service that will get a boost from repurposed jumbo jets from its airline sibling, Virgin Atlantic. Not to be outdone, Microsoft(MSFT) alum Paul Allen unveiled the world’s largest plane in May, called the Stratolaunch aircraft, with triple the wingspan of a Boeing 737. It is meant to carry three launch vehicles, each of which can put a 1,000-pound satellite into low orbit. THINGS ARE STARTING to look bubbly. “My business model right now…is I sell about $1 billion of Amazon stock a year and I use it to invest in Blue Origin,” Bezos told reporters in April. A report last year by the Tauri Group noted that 50 venture-capital firms invested in space in 2015, with spending eclipsing the prior 15 years combined. SpaceX’s latest money-raise of $350 million values it at $21 billion. By comparison, L3 TechnologiesLLL in Your Value Your Change Short position (LLL), a longstanding supplier to government space programs, which generates $900 million a year in excess cash, has a stock market value of $14 billion. SpaceX investors, including Google parent Alphabet (GOOGL) and Fidelity Investments, aren’t in it for a quick cash-out in an initial public offering. Musk has said he won’t take SpaceX public until he is on the way to realizing his long-term goal: to build self-sustaining colonies on Mars, complete with, as he described it at a conference last year, iron foundries and pizza joints. Bezos’ long-term vision is closer to home but no less ambitious: heavy industry will one day be moved into space, where access to solar power is abundant, leaving Earth for homes and light industry. ViaSat isn’t sitting still. It has plans to launch three satellites in the next four years to increase its data capacity and expand coverage. But free cash flow isn’t expected to turn positive until 2021. The problem is that consumer broadband services are squarely in the crosshairs of the new low-orbit players, so ViaSat could face more competition by the time it reaches its satellite payday. Shares have fallen 17% over the past year. Among military providers, Lockheed has more exposure than Boeing. Space systems make up 18% of its revenue. But Orbital ATK has more riding on space: Its satellite division brings in 26% of revenue, and a flight unit that makes rocket systems for both weapons and launch vehicles contributes 35% more. The shares are up 43% in a year but still look attractive. Orbital is expected to grow overall revenue 4%, to $4.6 billion this year, and earnings per share, 11%, to $6.17, leaving shares at 17 times earnings. For investors looking for gee-whiz appeal, consider that Orbital is the first mover in a business that it expects will become lucrative in a world awash in space gear: launching machines that can coax new life out of expired satellites. BUBBLES AREN’T ENTIRELY BAD. A Florida land boom in the 1920s ended with a painful crash but left behind new roads, rail stations, and entire cities. The dot-com stock craze of the late 1990s got the timing wrong but the emphasis right. America’s five largest companies today sell software, smartphones, and services that revolve around the internet. If space investing is indeed a bubble, it might prove to be a benign one, because most of the players who will take losses can afford them, and some of the stuff left behind could prove world-changing. Half of humanity lacks reliable internet access. New imaging technology is advancing the study of Earth’s economic activity, conflicts, and natural resources. Other developments will rival science fiction for wonder. A company called Deep Space Industries sees potential to send mining vehicles to meteors, grind their metals into powder, and use that to make space infrastructure through a manufacturing process called 3-D printing. If that idea sounds a little out-there, consider that the biggest obstacle it faces is launch costs. After launch, much of what happens in space is relatively cheap. Let Musk, Bezos, Branson, and Allen clobber one another with their wallets to bring those costs down, and the innovation that follows might astonish. Compared to its regional counterparts, South Africa is a wealthy country. It has a strong economy and a solid industrial base. It has the potential to become a regional leader and assert influence over all of southern Africa. And yet, South Africa today is focused almost entirely inward, its ability to project power constrained by competition between numerous factions. This wasn’t always the case. During apartheid, the country was ruled by an autocratic regime that was able to develop a coherent – albeit extremely exclusive – national identity that revolved around the white Afrikaners who controlled the regime. By institutionalizing segregation, it was able to ignore the interests of the majority and pursue its security imperatives. And so, during the Cold War, South Africa projected power throughout southern and central Africa; the military conducted operations as far north as Zaire (now the Democratic Republic of the Congo) and collaborated with the U.S. in anti-Soviet operations in Mozambique and Angola. (South Africa currently has a small number of soldiers serving in U.N. peacekeeping missions, but these missions aren’t central to the country’s interests.) Also during this time, South Africa developed nuclear weapons, which it later voluntarily gave up. But with the end of apartheid, the competing factions resurfaced, and South Africa turned its focus back to domestic affairs. The political liberation of South Africa’s population not only failed to fix many of the problems that decades of racial inequality had perpetuated, but in many ways it froze them in place. Post-apartheid governments have been more representative of the country’s population but have struggled to unite the diverging interests of various groups, creating a deadlock that severely constricts the country’s ability to establish a greater presence in southern Africa. This Deep Dive will examine the constraints, most of which are domestic, that restrict South Africa from forming a more unified nation and prevent it from asserting greater regional power. In 1948, South Africa formally adopted apartheid, a system of governance that excluded blacks and institutionalized racist practices that had become the norm but had not yet been codified in law. Unlike other colonized territories, such as the Americas, where the majority of the indigenous population died from diseases brought over by the Europeans, the indigenous population in South Africa remained the majority even after colonization. Groups identified today as black South Africans are mostly Bantu-speaking people who migrated to the area that is today eastern South Africa between approximately 1000 B.C. and A.D. 1700, consolidating their position in the region as farmers from A.D. 400 onward. They pushed into the region after the advent of agriculture, displacing the previous occupants, Khoisan-speaking nomadic herdsman. The Bantu people include a number of subgroups, such as the Xhosas, of which Nelson Mandela was a member, and the Zulus, of which current President Jacob Zuma is a member. In 1652, a Dutch East Indies expeditionary group arrived at what is today Cape Town and established it as a stopover settlement for ships sailing around the southern tip of Africa on the way to Asia. Descendants of these Dutch settlers eventually became known as Afrikaners, and their language, which evolved from the Dutch spoken by the settlers, became known as Afrikaans. European imperial powers were relatively unconcerned with South Africa until the Napoleonic wars, when Great Britain seized the Cape Colony to prevent France from taking it and potentially disrupting its trade route to India. The British clashed with the Dutch settlers, who saw them as foreign invaders, causing the Dutch to migrate to South Africa’s northeastern territories. They eventually created their own republics, which would operate largely independently of British imperial rule for the remainder of the 19th century. Once the British realized that this area was rich in gold and diamond deposits, the conflict between the British and Dutch settlers escalated, peaking with the Second Boer War, which lasted from 1899 to 1902. The British won the war, but the victory was not decisive, and the diverging interests that drove the two sides to fight went unresolved. Both sides recognized, however, the need for a political rather than a military solution. In 1910, a constitution was drafted that granted South Africa a great deal of independence from imperial rule, and the country was unified into a single state. It didn’t gain full independence, however, until 1931, formally leaving the British Commonwealth in 1961. Afrikaners took control of the political system, but the British were allowed to keep control of their economic assets, particularly in the mining sector. This arrangement was similar to the compromise reached after apartheid when black South Africans gained political control, while white South Africans (both Afrikaners and English speakers) were granted rights to their existing property. Black South Africans arguably enjoyed greater rights during the first half of the 20th century than they did during apartheid. For example, they were allowed to acquire freehold property and were not yet confined to “homelands” or subjected to mass forced migration. But they were by no means treated as equals. With much of their land seized, they were forced onto unproductive land. Many migrated to cities to seek employment, while others flocked to mining towns, where they faced appalling living and working conditions. South Africa thus has a history rife with division within and between the white and black populations. Apartheid was able to temporarily suppress these divisions, but it did so by subjugating black South Africans under the rule of the Afrikaner government. In many ways, apartheid sowed the seeds of its own destruction. Economic inefficiencies created by apartheid forced the government to gradually make concessions that allowed black political organizations to exert greater pressure on the government and eventually led to the collapse of the apartheid system. Many believe that it was international sanctions that ultimately brought down the regime. These sanctions, according to this view, placed enough economic pressure on the government to force it to give blacks more rights and eventually end apartheid altogether. But there is evidence to indicate that sanctions had a smaller impact than is generally assumed. A 1999 study published in the Journal of Political and Military Sociology presents compelling evidence suggesting that labor distortions caused by apartheid laws were more responsible than sanctions for the economic crisis that forced business elites and the government to compromise with the anti-apartheid movement. An ensuing liquidity crisis and the end of the Cold War were also likely more instrumental in bringing down apartheid than international sanctions were. During apartheid, blacks were prohibited from working skilled jobs reserved for white laborers. But in the 1960s and 1970s, South Africa’s manufacturing sector began growing, partly because of a government effort to boost the domestic defense industry, and companies encountered a skilled labor shortage. Skilled white workers were able to demand higher wages, which put pressure on companies’ profits. To address the shortage, the government began allowing blacks to fill certain types of skilled jobs. But the poor education available to most blacks – especially in rural areas – meant that this move alone did not increase the pool of skilled laborers enough to plug the gap. The government then attempted to relax travel restrictions that had limited labor mobility from areas where blacks had been forcibly relocated. (Roughly 3.5 million people were forced to move to agriculturally unproductive land between 1960 and 1983.) In 1979, the government recognized black labor unions, which helped bring more blacks to areas with jobs. More labor mobility, however, also led to greater political mobilization. And this resulted in a rise in organized demonstrations against business interests and, when large unions teamed up with the African National Congress, political interests as well. As social unrest escalated throughout the 1980s, the apartheid government responded with increasingly violent and repressive measures. Outside investors saw South Africa as more and more unstable. But the government had grown highly dependent on foreign investment to fund its import substitution industrialization plan, a key part of which was the defense sector. South Africa was highly reliant on foreign debt, much of which was short-term loans. Worried that the unrest would endanger borrowers’ ability to pay back their loans, foreign lenders decided to stop rolling over this short-term debt, which led to a liquidity crisis in 1985. This put even more pressure on the government to end apartheid in order to bring back investors. The fall of the Soviet Union also opened up the government to compromise with anti-apartheid groups. Suspecting that the ANC, which was allied with the South African Communist Party, was covertly supported by the Soviets, the government feared that capitulations to the ANC could lead to a communist uprising. It was this fear – heightened by the arrival of thousands of Soviet-backed Cuban troops in Angola – that had encouraged South Africa to develop a nuclear bomb. By the end of the Cold War, the government’s main fear was no longer a communist revolution but a civil war triggered by black nationalists. The Afrikaner government thus shifted its focus from regime survival in the face of a communist threat to maintaining as much political power as possible under a new regime. It no longer made sense to resist compromise, though the Afrikaners successfully fought to protect the property and wealth whites had accumulated under apartheid. With the end of apartheid in 1994, many – not just in South Africa but around the world – believed that non-white South Africans would be liberated and that a future full of opportunities that had been denied them for centuries would be opened up. But this was overly optimistic. White South Africans may have been willing to relinquish their political power, but they refused to forfeit their economic interests. The constitution of the new, free South Africa was born of a compromise between these two groups that froze in place significant aspects of the asymmetric relationship between wealthy – usually white – business and land owners, and unskilled – usually black – wage laborers. The friction between these two groups is one of South Africa’s core constraints. Faced with this domestic discord and unable to reform the economy to provide greater economic opportunities for all South Africans, the government has been focused on internal affairs rather than trying to shape the world around it. The country’s declining power may also be partly attributed to diminishing U.S. support for anti-communist regimes following the end of the Cold War. But South Africa’s military was not heavily dependent on U.S. aid even prior to the Soviets Union’s collapse. Its military strength dwindled after the ANC took power and cut defense spending. The new government didn’t see its interests being served with a large military that had the ability to project power in neighboring countries. It instead turned its focus inward and diverted those resources to development initiatives. The constitution that ended apartheid was a compromise between the ANC, which primarily sought political power, and owners of land and capital in the country, who sought to retain the wealth that they had accumulated during the apartheid era. Those with economic power were unwilling to turn over political power without enshrining in the new constitution enduring property protections. This essentially made asset and land redistribution impossible. Though wage equality has increased since the end of apartheid, wealth equality has not. A small black elite has emerged, but poor employment and educational opportunities mean most blacks are still far behind whites in terms of economic well-being. A large portion of the constitutionally protected wealth of white South Africans was generated through mineral and commodity companies that had access to suppressed wage rates. These companies generated enormous wealth in South Africa from the late 19th century through the 20th century, in part because white South Africans were familiar with the global system of trade. Though other African countries also had mineral resources, by the early 20th century South Africa had long-standing governing institutions that could provide continuity during the transition from British colonial rule to independence. South Africa thus avoided the political and economic collapse that so many other colonized African countries suffered. This is not the only reason South Africa is today wealthier than other African countries, but it is an important part of the explanation. After apartheid, mining, commodity and manufacturing companies lost the ability to directly suppress wages in the same way they previously had done. They began incorporating new tools in labor contracts, such as production quotas, that enabled them to avoid paying workers standard wage rates. Industries that faced rising wages due to union activity were moderately successful in replacing cheap labor with technology. These factors, plus the lack of quality education for non-white South Africans, have resulted in continued high rates of unemployment among unskilled laborers. Some South African companies lament the lack of skilled labor in the country, but roadblocks in the public education system that existed under apartheid persist. As a result, some companies have turned to Zimbabwean immigrants, who are thought to have better English skills than black South Africans, for semi-skilled positions. Only about 30 percent of South Africans speak some English, and just 10 percent speak it as their first language. This has created an undercurrent of xenophobia, as immigrants are seen as taking away the few jobs available to the local population. Overcoming these challenges requires new industries that can incorporate a larger part of the population. And this requires investment capital – a fact not lost on those involved in the 1994 compromise. Indeed, many believed the end of apartheid would be a boon for foreign investment. But this did not materialize, in part because the ongoing lack of skilled labor in South Africa limits economic growth and, therefore, investment opportunities. In fact, the end of apartheid and lifting of international sanctions actually caused a surge in capital outflow, as South African investors sought better opportunities outside of the country. Today, total investment – including domestic investment – as a percentage of gross domestic product is about the same as it was in 1995. Risk capital for earlier-stage ventures is also in short supply, partly because of the high barriers to entry for new companies. Many investors fear that more populist policies could be introduced and that the risk of asset seizures will subsequently increase. This seems unlikely given the property protection rights outlined in the constitution and South Africa’s history of judicial independence – during apartheid, even Nelson Mandela commented on the fairness of certain judges in the Rivonia Trial, despite their membership in the apartheid-supporting National Party. But the fear that South Africa might empower an autocrat similar to Zimbabwe’s Robert Mugabe and initiate a campaign of property seizures nevertheless inhibits greater capital inflows. The failure to attract more investment has resulted in an economy that is highly dependent on exports and consumption, even though unemployment is high and people have little money to spend. The need to attract investment presents another constraint for the South African government. On the one hand, it must attempt to solve the large-scale socio-economic challenges that the country continues to face, and one way to do this is to increase government spending on social programs. But on the other hand, if the government were to significantly increase its deficit, it would need to finance the gap with more debt, and investors would likely see this as a sign of poor financial management and increased risk. To encourage investment, therefore, the government must maintain fiscal discipline, which reduces its ability to meet the pressing social needs of its constituency with greater government spending. As investment has stagnated, the ANC and its unionist allies have increasingly seen their interests diverge. The South African political landscape is being reconfigured, with new groups forming to represent disparate interests that no longer align as they did 30 years ago. The coalition that broke apartheid is losing its ability to govern effectively. During apartheid, the ANC allied with the South African Communist Party and the Congress of South African Trade Unions. This coalition, called the Tripartite Alliance, didn’t see eye to eye on everything, but the parties had enough overlapping interests – their opposition to apartheid being the most important one – that they could find sufficient common ground to work together. But after apartheid ended, the disparate aims of these organizations gradually overshadowed their similarities. Members of COSATU and the SACP became disillusioned by what they believed was the ANC’s willingness to work too closely with white economic interests at the expense of workers and black nationalists whom they were supposed to represent. But the ANC needed to cultivate good relations with companies and wealthy individuals who were the source of the tax revenue it was so dependent on; it was this revenue that funded the social initiatives the party promised to deliver. These political divisions represent an underlying reality in South Africa: There is no unified conception of a South African identity. This has for hundreds of years created competing loyalties and, therefore, interests that were only temporarily set aside to end apartheid. Much of the ANC’s support is derived from rural leaders who have a certain degree of autonomy from the central government. To maintain their support, President Jacob Zuma has essentially constructed a patronage network – which many refer to as crony capitalism – whereby lucrative contracts are given to tribal leaders who are political supporters of Zuma and the ANC. It’s no surprise, therefore, that much of Zuma’s support comes from rural areas. But given that the Tripartite Alliance is fracturing and new political entities are rising to challenge the ANC, the party needs these patronage networks to stay in power. The loyalty of people in these areas lies with local leaders, not the central government, so the ANC depends on their support. There’s no reason to believe that this coalition of interests could be held together by another ANC leader who decided to do away with these patronage networks. This institutionalized dependence on patronage networks is a domestic political constraint that will continue to put pressure on the ANC and will likely drive further intra-party divisions. That loyalty is often developed and forged around local and tribal institutions further adds to the competition of identities in the country. South Africa is essentially a collection of statelets, all competing for their own interests. Without a coherent national identity, the country will fail to find solutions to its social and economic problems for the foreseeable future. Considering that its economy has nonetheless outpaced other countries in the region, despite its high levels of inequality, South Africa has the potential to become a regional leader. And indeed, it has made some strides in terms of living standards since the end of apartheid. But these advancements have not been enough to enable the country to expand its focus beyond its internal affairs. A country can’t project power outside its borders if it’s struggling to build the basic foundation necessary to hold up any nation.